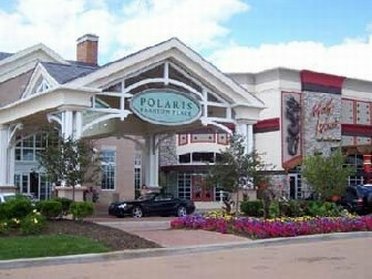 Polaris Mall in Columbus, Ohio, is the state's largest shopping mall, on Polaris Parkway in Delaware County. It's on the northern edge of Columbus. The anchor stores are JC Penney, Kaufman's, Lazarus, Lord and Taylor, Saks Fifth Avenue, Sears. There are over 160 other smaller stores, with lots of opportunities for shopping and dining. Polaris Mall of Columbus Ohio is also known as Fashion Place, and has hours of Monday - Thursday, 10:00 am - 9:00 pm, Friday - Saturday, 10:00 am - 9:30 pm, and Sunday, 11:00 am - 6:00 pm. To get to Polaris Mall in Columbus Ohio from the north, take I-71S towards Columbus, take exit #121, and turn right on Polaris Parkway, and the mall will be on your right. To get to Polaris Mall in Columbus Ohio from the South, take I-71N towards Cleveland, take exit #121, and turn left on to Polaris Parkway, and the shopping mall will be on your right. Anchor stores: JC Penney, Kaufman's, Lazarus, Lord and Taylor, Saks Fifth Avenue, Sears.